StriveScan is the exclusive provider of student scanning for the regional college fairs sponsored by these NACAC affiliates: New England (NEACAC), New Jersey (NJACAC), Illinois (IACAC), Missouri (MOACAC), Great Plains (GPACAC), Rocky Mountain (RMACAC), Pacific Northwest (PNACAC), Western (WACAC), and Hawaii (HACAC) ACACs. We also work with individual high schools, community-based organizations, and other organizers of college and university events across the United States and in over 30 countries globally. Additionally, we provide scanning for organizations, university tours, and boarding schools in partnership with the Colleges That Change Lives (CTCL), Council of International Schools (CIS), and Linden University Tours and Boarding School Expos. Students register via their own phones and a barcode will be texted and emailed to them immediately. 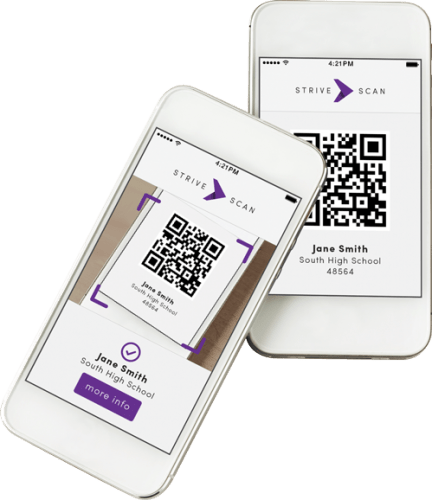 Colleges can download the StriveScan app to scan student phones and get access to their information instantly. Most fairs include StriveScan with their registration fee.